Downloading – How to do it; where to source the music (iTunes, Emusic, Own label websites; Podcasting) – all the latest technological advances and options on how to enjoy Classical Music are featured in the new super large edition of the indispensable Gramophone Guide. This opening feature is just one of the tome’s useful attributes. There are so many. 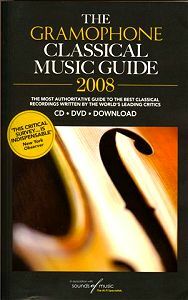 The growing volume of DVD releases of concerts, operas, ballets, historic recordings and documentaries has prompted, in response to readers’ requests, the incorporation of DVD reviews into the main body of the book; so if you want, for instance, to find recommended recordings of Verdi’s La Traviata, you can find DVD recommendations with the audio suggestions. The collections section also includes DVDs featuring favourite artists. Equally useful are the brief biographical details for each composer before the reviews of their works. For some cornerstone repertoire pieces, there are boxed comparative reviews; for example, on page 711 eight comparisons of recordings of Mozart’s Symphonies 40 and 41 are given. The authority of Gramophone’s distinguished reviewers has always been the rock on which music lovers have built their collections since April 1923. This latest Guide contains some 3,000 up-to-date reviews of currently available CDs including important current reissues. All have a definitive one to three ‘disc’ rating with a distinctive diamond symbol indicating "simply the best" - and a price guide. Other features include: the current Records of the Year; ‘100 Great Recordings’; suggestions of works to build a basic library; and essays on the historical periods of music from Early Music to The Romantic Era and ‘Into the Future.’ The latter feature, useful for many who might find ‘Modern’ works ‘difficult’, has a list of seminal works, from Bartók to Varèse; an explanation of the term ‘Serialism’, a list of key terms, ‘Recommended Repertoire Exploration’ and a box entitled ‘Looking into the Future’ with another list that includes recordings of: Adams’s El Niño, Pärt’s Lamentate. Da Pacem Domine and Turnage’s Scherzoid and Yet Another Set To. Informative, intelligently and practically organized, and comprehensive: as ever, the 2008 Gramophone Guide is a must for all serious record collectors.